Possible Political Prisoners (www.pp3.cloud) is a database and web site dedicated to tracking political prisoners. Currently we have about 16,800 worldwide. In a glance, one can compare the quantities attributed to various countries, examine the list of prisoners in any country and examine the details of any prisoner. Also anybody can register and log in, then: 1) create a record for a possible political prisoner; 2) attach unlimited newslinks to any prisoner; 3) upload a photo of any prisoner; 4) blog about any prisoner. The newlinks and blogs will appear on the detail page of both the prisoner and the country. 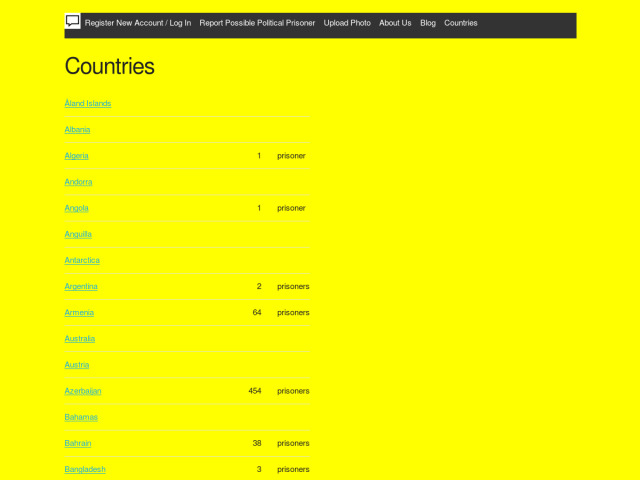 The list of countries responds to your preferred language setting. Also the individual prisoner descriptions are in the local language wherever possible, and photos are displayed if available.